Leonard William French was born in Brunswick, Melbourne in 1928. After studying sign writing at Melbourne Technical College, he held his first solo painting and mural exhibition in 1949 at Tye’s Gallery in Bourke St, Melbourne. As a young painter, French was initially influenced by the Mexican muralists; his high regard for the French painter Fernand Léger spurred a continuing dedication to the philosophy of art at the service of the common man. French drew much of his inspiration from literary sources including The Bible and Homer’s Iliad and Odyssey. Perhaps the most significant influence was Evelyn Waugh’s biography of the 16th-century English martyr Edmund Campion: timeless legends filled with the notion of the struggle and spiritual journey of a hero. The ornate splendour and iridescent luminosity of the richly textured surfaces of French’s paintings create a striking visual impact imbued with meaning. The painter creates intricate works of depth and beauty by incorporating iconic symbols such as the Celtic cross, circle, dome, serpent, bird and fish into his richly layered and glazed paintings. From 1952 – 1956 French undertook independent studies throughout Ireland, England, Holland and Belgium. Returning to Australia, he taught at the Melbourne School of Painting and Graphic Arts. During this time, French designed the sets and costumes for Melbourne’s Australian Ballet Guild production of the Nutcracker Suite. Whilst Exhibitions Officer at the National Gallery of Victoria from 1956-60, French began work on his Campion series, drawing inspiration from noted writer, Evelyn Waugh. In 1958, he held a significant solo exhibition at the Melbourne Museum of Modern Art. The following year, French was awarded the Peace Congress Prize which enabled him to travel and study in India, Indonesia and Japan. He continued independent study in Asia throughout 1960-61 and was awarded the Sulman Prize in 1960. In 1961, French’s Campion series was exhibited in Sydney and Melbourne. In 1962-63, the artist travelled and studied extensively throughout Italy, Spain, France, England and Greece and spent considerable time on the Greek Island of Samos. In 1963 French was awarded the Blake Prize from the Art Gallery of New South Wales, Sydney. 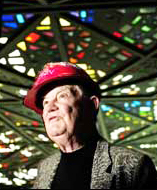 In the same year, he was commissioned for the stained glass ceiling in the new National Gallery of Victoria. In 1965 French again undertook independent study and travel in the United States, while his Samos Miniature series was exhibited in Melbourne, Perth and Adelaide. 1968 saw the new National Gallery of Victoria open, with the Sydney Morning Herald’s headline 'The Year of Leonard French' propelling the artist to instant fame. It is this large scale work for which he is arguably most renowned. The enormous kaleidoscopic stained glass ceiling, often referred to as a ‘‘Persian carpet of light”, was a steep learning curve for the artist who had never previously worked in glass. In the Great Hall ceiling French had confirmed that "he was prepared to make art objects that were frankly beautiful". French continued to garner a reputation for his massive murals, tapestries and glass mosaic windows which grace the façades, ceilings and walls of numerous significant buildings in Australia and overseas. Along with the National Gallery of Victoria, French’s work features in the National Library in Canberra and Haileybury College Chapel in Melbourne. In 1969, French was honoured with an OBE and in 1970 the Art Gallery of South Australia exhibited the first retrospective of his work. In 1971 French’s major new series, The Raft, opened at Rudy Komon Gallery in Sydney. The following year, French was appointed as a member CAAB Canberra. 1980 saw French win his second Blake Prize for Religious Art from the Art Gallery of NSW. The artist completed his DarkCircus series from 1981-84. In 1982 he was appointed to the Board of the National Gallery of Art Canberra. From 1993-94 the mini-retrospective, 'Leonard French: Paintings 1987 – 1993' was exhibited in Sydney and Melbourne. French's work is represented at the National Gallery of Art, Canberra, all state galleries, many regional galleries and numerous major international collections, including MoMA, New York.